Source: U.S. Energy Information Administration, Monthly Electric Utility Sales and Revenue Report with State Distributions (Form EIA-826). Republished January 31, 2013. Text and graph were corrected. Participation in electricity residential consumer choice programs increased faster in Illinois in 2012 than in any other state—an exception among retail electric choice programs that have had mixed success. Under these programs, electricity distribution providers still operate and maintain the infrastructure to deliver the electricity and coordinate billing: these costs constitute the "distribution charge" on a customer's bill. The third-party suppliers arrange for the supply of electricity, and it is this "commodity" or "energy" part of the bill where customers can potentially gain savings. The driver was the introduction in Illinois of a program that allows municipalities and counties to contract in bulk for electricity supply from a variety of potential providers. Third-party power providers leveraged low wholesale power rates during 2012 to offer steep discounts on electricity. 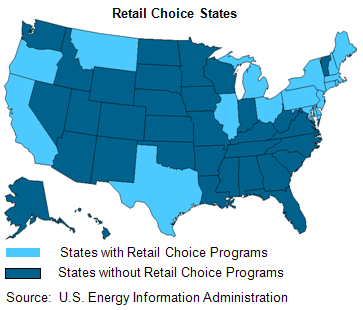 Retail choice programs, which exist in some but not all states, let electric power customers choose among competitive electricity suppliers. Some states show growth in their programs, while participation in others lags, or is favored by industrial and commercial customers rather than residential customers. 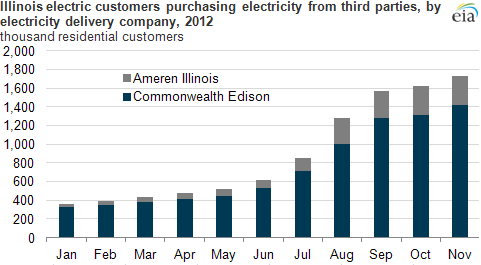 Preliminary 2012 data collected through November from a sample of U.S. utilities show that over 1.3 million out of 5 million residential electric customers in Illinois switched their energy supplier from their local Investor-Owned Utility, or IOU, to a third-party power provider between January and November. In December 2012, the City of Chicago's nearly 1 million residents joined the growing list as Mayor Rahm Emanuel approved a contract with Integrys Energy Services (Chicago's contract is not included in the chart above). The chart above shows the dramatic rise participation in retail choice programs with the number of residential customers on delivery-only service, as reported by electricity delivery companies (here, IOUs). The numbers are dominated by Commonwealth Edison customers, whose territory covers most of northern Illinois; Ameren covers most of the remainder of the state. Third-party energy suppliers in Illinois include: Ameren Energy Marketing, Direct Energy Services, First Energy, and Integrys. In 2009, Illinois joined five other states (Massachusetts, Ohio, Rhode Island, New Jersey, and California) in enacting legislation allowing communities and municipalities to negotiate with power providers on behalf of their citizens, for residential and small commercial customers. Nonetheless, until recently, participation in Illinois retail electric choice programs was low. The situation changed beginning in late 2011 due to a combination of revisions to the Illinois community aggregation law, outreach programs aimed at easing the aggregation process for communities, and a steep drop in wholesale power prices. Third-party power providers were able to immediately offer significantly lower rates than IOUs, whose rates are less responsive to power market fluctuations because of regulatory rules. In September 2011, Oak Park became the first Illinois municipality to sign a contract, securing 30% savings on electricity commodity costs for its residents. Two months later, other communities passed referenda to participate, and the trend continued to increase through 2012. The Illinois Commerce Commission (ICC) lists 467 Illinois communities known to be participating in or pursuing community aggregation programs. Of those that have chosen suppliers as of Jan 14, 2013, the ICC reports the average electricity rate as 4.5 cents per kWh. In comparison, the default rate from the Illinois Power Agency is currently 8.1 cents per kWh. It is scheduled to drop on July 1, 2013, but is expected to remain above 6 cents per kWh. However, it is possible that this large disparity in costs between regulated IOUs and third-party electricity suppliers could reverse itself—if IOU rates are redrawn preceding a significant increase in wholesale power prices, the third-party suppliers may not be able to undercut IOU rates. While price is usually cited as a main concern, third party power providers may offer options the IOU does not: for instance, "green power" (buying their electricity from renewable generators) or cleaner power (one option from Integrys excludes electricity from coal-fired power plants). However, consumers purchasing from third-party suppliers cannot be on a time-of-day rate—that option is only offered through the IOU. The data cited above are collected on the monthly survey Monthly Electric Utility Sales and Revenue Report with State Distributions (Form EIA-826), which collects sales, revenue and customer count data from a subset of all U.S. retail electric market participants. Data collected for Illinois residential customers show participation rates in retail choice programs in November 2012 are 38%, up from 8% in January 2012.